Raychem HDC/HDF mineral insulated (MI) Cupro-Nickel series heating cables are suited for use in hazardous areas. They are extensively used for a wide variety of industries, such as oil and gas, chemical and petrochemical, power generation, gas storage and many other industrial applications. Cupro-Nickel heating cables with copper conductors (HDC) are available in very low resistances to allow for long line applications with a limited amount of supply points, in particular for applications exceeding the capabilities of Polymer Insulated (PI) series heating cables. 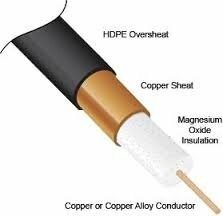 The heating cables can be used for exposure temperatures up to 400°C and a typical power output up to 70 W/m. Heating units are also approved for Dust environments. Temperature classiﬁcation (T-rating) has to be established by using the principles of stabilised design or the use of a temperature limiting device. Use TraceCalc design software or contact us. Delivery length of bulk cable on coil depends on type of resistance and is limited by max. coil length as indicated in the table on top. Factory terminated elements are limited by a max. weight of 50kg, however to ensure practical and safe on-site handling, it is strongly recommended to limit element lengths to 25 - 30kg. Not all resistances are standard items and as such may not be in stock. Contact Pentair to confirm lead time. Pentair requires the use of a 30 mA residual current device to provide maximum safety and protection from ﬁre.